A picture I ran across the other day while looking for some color inspiration showed about 10 or more hot air balloons of all different colors and patterns speckling a European horizon. It was lovely against the pale blue sky and tan terrain. Some were striped in multi-colors, like the one I have designed for you, others had fewer colors and varied stripes or different patterns all together. For this applique I used five different colors and swapped them every two rows. Have fun making this simple and easy applique! Gauge Swatch: 1’’w x 1’’h (2.5 cm x 2.5 cm) ch 5. Let me know if you need any help with the pattern! 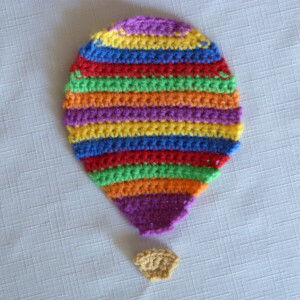 This entry was posted on Thursday, October 1st, 2015 at 12:00 AM by Amy	and is filed under Free Crochet Patterns. You can follow any responses to this entry through the RSS 2.0 feed. You can skip to the end and leave a response. Pinging is currently not allowed. I absolutely love this!! Great job as usual. I admire your talent, Amy!! I’m glad you like it, Geraldine! Oh, how darling !! This is adorable and I love the use of color 🙂 Thank you ! Sometimes a lot of color is just what a project needs. 🙂 I’m pleased you like it. Happy you like it, Angelica! Have fun! Adorable. THank you for sharing. Is it posible to scale it down? I would like to make one but with the half size. How can I do it? You can follow the general increases and decreases but cut the beginning number of stitches down and the amount of rows as well.